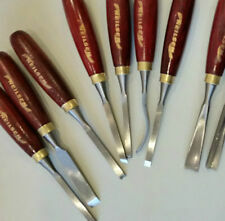 Set of 5 Henry Taylor of Sheffield Wood Carving Chisels / Gouges / Skews, of Small Size. Each with green "Acorn" label to handle and stamped "H. TAYLOR MADE IN ENGLAND" with number to shaft. No. 11 - 7.81mm wide at tip. 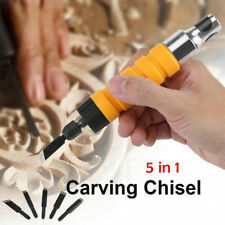 Application:Stonemason carving knife. 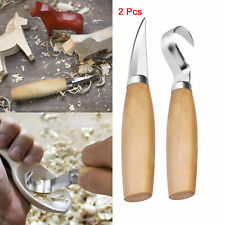 Model:Carving knife set. 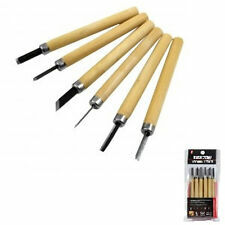 Specifications:8 piece carving knife set. 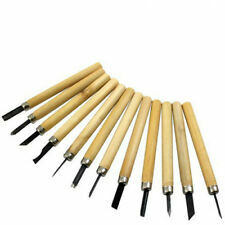 Type:Hand Tools. Texture of material:tungsten steel. Number of Pieces:8. In verygood general 'as found' condition. Sorby x 2 - One is swan neck. Marples x 2. 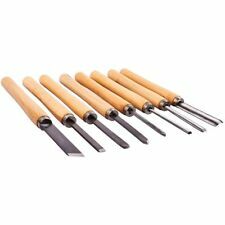 Total of 10 Chisels from a shed clearance all are sharp and ready for use. Stamped on the blade W Marples & Sons Sheffield with Shamrock logo & 15. 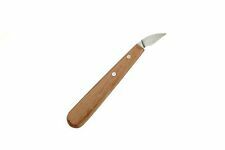 Long beech wood handle with brass ferrule. WOOD TURNING CHISEL by Henry Taylor. Used once only. Dispatched with Royal Mail 2nd Class. 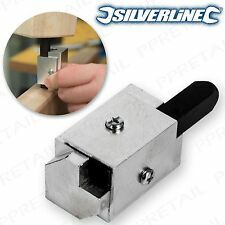 Spring-Loaded Steel-Bodied Corner Jig For Knocking Rounded Corners Out Of A Routed Hinge Recess High Quality Tungsten Steel Hit With A Mallet & Pare Out Waste . No4, 213mm-8"3/8 LONG, 6mm-1/4" WIDE. ONE HAS A CREST ON THE HANDLE BUT IT IS A SORBY MARKED CHISEL. 26 mm - 19mm - 16mm -12mm - 9mm - 7mm approx. 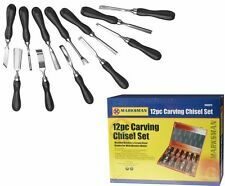 12PC PRO WOOD CHISEL CARVING WITH WOODEN CARRY CASE. VINTAGE-2.5CMPATTERNMAKER'S BEVEL EDGE PARING CHISEL BY NOOPER'S PORTSAND JT .